Down comforters are a key component in the creation of the perfect bedroom ensemble. Finding the right down comforter can be difficult. Fortunately, DownPillows.com carries the finest down comforters made. DownPillows.com features Pacific Coast � down comforters. Pacific Coast � is widely known as the finest manufacturer of luxury bedding. Moreover, many Hyatt �, Marriott �, Ritz-Carlton �, and other premier hotels feature Pacific Coast � down comforters. Gift Wrapping: DownPillows.com is proud to offer you the option of putting a gift message in your order FREE of charge. Additionally, we offer gift wrapping. For $15 we will gift wrap all items in an order in a beautiful holiday gift bag. Select these great options at checkout. $4.99 UPS Ground Shipping on ALL ORDERS to the Continental United States. The Ritz-Carlton �, Marriott �, and Hyatt � marks are solely and completely owned by the Ritz-Carlton Hotel Company, L.L.C., Marriott International, Inc., and Hyatt Corporation respectively; these trademarks are not licensed or owned in any manner by DownPillows.com. The Ritz-Carlton �, Marriott �, and Hyatt � trademarks are used on the DownPillows.com website to inform DownPillows.com customers that the products featured on the DownPillows.com website are often found in these fine hotels. 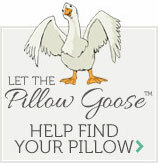 The products found on the DownPillows.com website are manufactured by Pacific Coast Feather Company, United Feathers and Down, National Sleep Products, Pacific Pillows, and Phoenix Down. None of the products sold on the DownPillows.com website are built by or carry the trademark of Ritz-Carlton �, Marriott �, or Hyatt �; however, Ritz-Carlton �, Marriott �, and Hyatt � hotels regularly feature certain products sold on the DownPillows.com website in their hotels.